The next Full Moon Party is on Sunday, 19 May 2019. Limited rooms left - Book now! 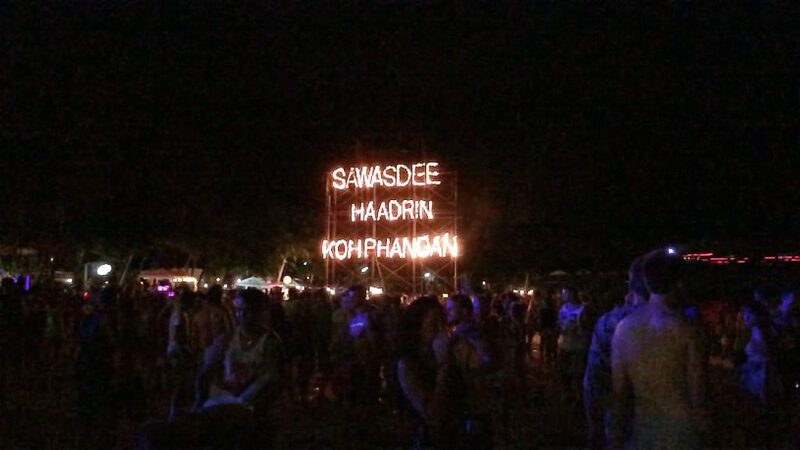 Are you planning your trip to the Full Moon Party in Koh Phangan? This event is one of the most popular festivals for tourists and travelers in Asia and Thailand. This article will introduce you to the weather in Koh Phangan during November, but if you haven’t yet decided the time of your trip, read our full weather guide first. You can also use our website and articles to plan your own Full Moon Party trip. Novembers are usually rainy in Koh Phangan. The monsoon season is properly starting during this month but there aren’t as many rainy days as in December. Despite the rain, the Full Moon Party will be held and there are people attending from all around the world. On an island like Koh Phangan, even rain feels nice and won’t ruin your holiday. Just pick clothes that can get wet and you can party in the rain with other tourists and travelers. If there happens to be bigger storm during the party, just spend time inside the venues near the main party beach. Koh Phangan is warm destination around the year. Summer is already over in November, and this is why the temperatures are nicer for those travelers who come from colder countries. The average day temperature is just under 30°C and nights are almost as warm. When should I visit the Koh Phangan? Usually, people will recommend February, March, or April as the best times to take part in the Full Moon Party. This is because these months aren’t as rainy as the monsoon season but also not as hot as the summer months. Only negative side during this time is that there will be more tourists than usual. If you want to avoid the lines and crowd, any other time around the year is also a good time to visit Koh Phangan. There may be more rain or the weather will be too hot if you are from colder countries, but it doesn’t mean that your Full Moon Party won’t be amazing. Use our website to plan your Full Moon Party holiday with all the necessary information. Read hotel recommendations and book your accommodation. With our general party tips, you will know what to wear, where to get the transportation and what activities to try around the Full Moon Party beach. Thailand is a perfect travel destination around the year, and you shouldn’t skip the Full Moon Party experience. Find the best and cheapest buses, trains, and ferries to get to Koh Phangan. Groove Island 2019 Payment Plan information – Starting at $74.50/mo. I love to travel, and I've been to festivals all over the world. On this site, I share my passion for the Groove Cruise and other electronic music experiences. You'll find discounts, travel tips, and general festival info to help you plan your next unforgettable weekend. Instant $50 off every person (up to $200/cabin). Valid on every sailing. Note: Promo code perk(s) are subject to change at any time without notice. The perk(s) shown after applying a promo code during checkout are to be considered accurate. Copyright 2014-2019 GrooveCruiseChris.com. See you on the ship!